In a Nutshell: By transforming sustainable bamboo fiber into soft viscose fabric, Cariloha produces an eco-friendly line of luxe apparel, bedding, and bath goods that align with aspirational lifestyles. The bamboo-based viscose wicks away moisture and is noticeably cooler and more comfortable than conventional fabrics like cotton. In Cariloha stores across the country, customers are given an opportunity to directly compare its viscose with that of other fabrics in carefully tuned store environments that cater to the senses. As a result, in 2017 Cariloha made the Inc. 5000 list of America’s fastest-growing companies for the sixth year in a row. At a time when many retailers are struggling to preserve their brick-and-mortar presence, Cariloha has expanded to more than 60 stores in 16 countries — with no plans for a slowdown. Cariloha got its start in 2007 as a purveyor of island-leisure products including sunglasses, watches, and purses. Within a year it was operating stores in three cruise-port locations: Cozumel, Ocho Rios, and St. Thomas. But, as a lesser-known brand, Cariloha struggled to connect with the vacationing consumers it was catering to. One day, CEO Jeff Pedersen watched a customer in Cariloha’s Cozumel store choose a watch made by a more familiar company instead of a Cariloha-branded piece, and he decided to try something new. A test-run of 5,000 shirts woven from bamboo-based viscose fabric quickly sold out, and soon the company was retooling its store design, promotions, and marketing around an entire line of bamboo-based products. From a production and marketing standpoint, bamboo is an ideal source for fabric. As the fastest-growing plant in the world, it’s intrinsically sustainable. It requires no fertilizer, pesticides, or chemicals to grow. And it converts the greenhouse gas carbon dioxide into oxygen much more efficiently than trees. Cariloha converts harvested bamboo into usable pulp through a closed-loop process wherein the pulp is dried, milled, and spun into thread before it’s woven into the viscose fabric. In 2010, Cariloha began opening additional stores throughout the US and Caribbean, starting an expansion process that hasn’t abated. By 2012, it had opened 30 locations in 11 countries. Over the past three years, as the brand has continued to expand its physical footprint, sales have grown by 113%, a testament to the growing demand for sustainable products that feel just as good to support as they do to wear. In addition to seeking out brands that respect the environment, today’s consumers appreciate comfort, function, and style. And Cariloha fits the bill. “We’re soft, cool, and clean, and green — and that really resonates with our customers,” Scott said. Viscose is discernibly softer than cotton and has an appealing, silky feel. It’s breathable, meaning that it wicks away moisture and keeps active wearers cooler. And it naturally repels odors and allergens without exposing wearers to irritation-causing chemicals. The demand for Cariloha’s combination of soft, cool, clean, and green fabric has led the brand to expand its apparel line. Cariloha offers outerwear, underwear, socks, sleepwear, and accessories for women and men. The luxurious feel of viscose has helped Cariloha move from the closet into bathroom and bedrooms with bamboo-based towels, bathrobes, and sheet sets. 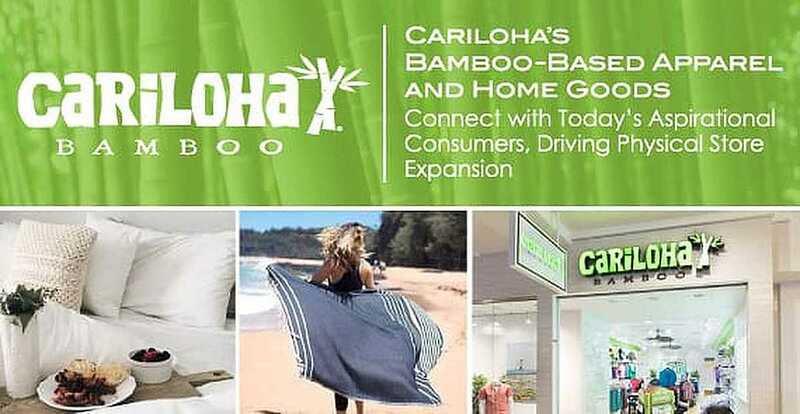 And the popularity of Cariloha’s bedding products has enabled the brand to develop a memory foam mattress business leveraging its bamboo base to offer a complete sleep solution. While the bedding and mattress products have been a huge success, the development of Cariloha’s sleep-solution concept came about gradually. With every new product, Cariloha has relied on its physical store presence to demonstrate the unique qualities of bamboo to its customers. “When people get a chance to touch our products, to experience the difference, they want to adopt us as part of their lifestyle. We generate sales by appealing to our customers’ senses,” Scott said. The in-store experience starts with Cariloha’s “Feel the Difference” display, which lets customers physically compare different bedding fabrics for themselves. From there, merchandise is strategically presented throughout the store. Music and even a custom fragrance are added to deepen the textures and engagement. Scott explained that the brand continues to flourish because customers return to its stores and e-commerce site to buy more bamboo-based products for themselves or as gifts. Moving forward, Cariloha has plans to continue to build out its product offering to give customers more reasons to experience the brand every day. “As for apparel, we’re bringing variety — different styles, colors, and cuts that are on trend but that also have those amazing bamboo properties,” Scott said. Cariloha sells its bamboo-based products in more than 60 store locations worldwide. Sleepwear and bedding, including mattresses, continue to gain momentum. “So many people have trouble sleeping. Our customers are continually letting us know that our sleepwear and bedding solutions are the only things that work for them,” Scott said. Cariloha mattresses are finding their niche in an increasingly crowded space thanks to smaller footprint boxes for shipping direct to consumers and providing a 100-night trial and a 10-year warranty. “As more and more customers get to know us, the more they seem to want,” Scott said.